Adrienne of The Rich Life (on a budget). Booties are such a wardrobe staple—we bet you have at least two pairs in your closet—that it seemed high time Adrienne of The Rich Life (on a budget) and I featured them in a “How I Wear My” post. They look great with pants, skirts, dresses, even shorts, and can be dressy, casual or anything in between. They may be the hardest working shoe in your collection! Do note all the touches of animal print here, which really helped enliven the entire post. Enjoy! Adrienne of The Rich Life (on a budget), above, my lovely “How I Wear My” partner, writes, “I am wearing an asymmetrical crewneck sweater by Stella Carakasi (from a couple of seasons ago) which I love, black faux leather leggings, and low-heeled suede booties from Boden that have really gotten a workout since I got them last fall. 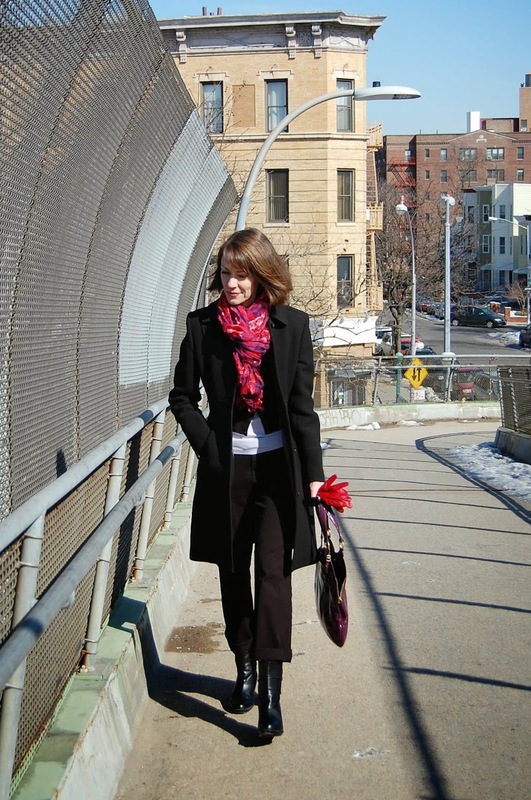 They are very comfortable and go with practically everything I wear.” She is carrying a wonderful Adora bag, handcrafted in Italy. This is such a great outfit on Adrienne and I love all the accessories, from the booties to the jewelry to the bag. The accessory I may be most jealous of right now, however, is the sun! Greetje of No Fear of Fashion. I love this look on Greetje and I especially love those Hoss Intropia booties! The fact that she calls them silver/bronze/golden reminds me of an episode of The Rachel Zoe Project where one of her assistants joked Rachel’s favorite color was “gilver”—a blend of gold and silver. I love Greetje’s smile in this great shot her husband took of her featuring graffiti art in Amsterdam. Why not have Albert Einstein in your fashion photo? 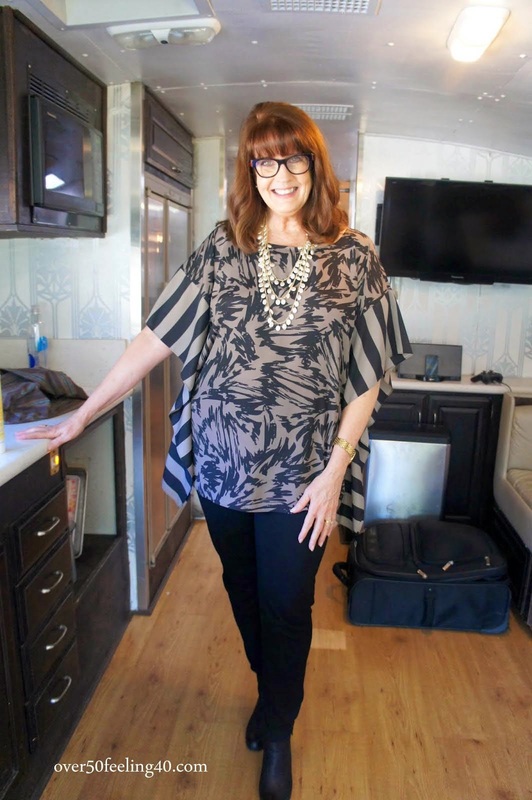 Pam of Over 50 Feeling 40 looks fantastic in this unusual print top worn with a multi-strand necklace, a pair of black pants and BP Trolley Booties. This is my new favorite picture of her! Catherine of Not Dressed As Lamb is so ready for the city in this terrific ensemble of a Zara coat (half leopard, half black, 100% cool), denim, Asos booties and a baseball cap. I love this look! You all know by now what a big fan I am of the 1920s look. This is like an updated and edgy Gatsby ensemble on Nora and I just love it! I do too, there is something about red plaid and leopard that just works, and I like the way Linda has worn them here, especially with the addition of the big pearl necklace. I vote that Susan stick with the flared jeans. They seem very modern to me and make her legs look a mile long! The Prada booties (And that jacket! And that scarf!) are the perfect addition(s). I really love this neutral look on Alice, especially that she punched up the glam factor with the great jewelry, dark manicure, and Tory Burch bag. Alice calls this her idea of a great weekend uniform and I agree! Gracey of Fashion For Giants. 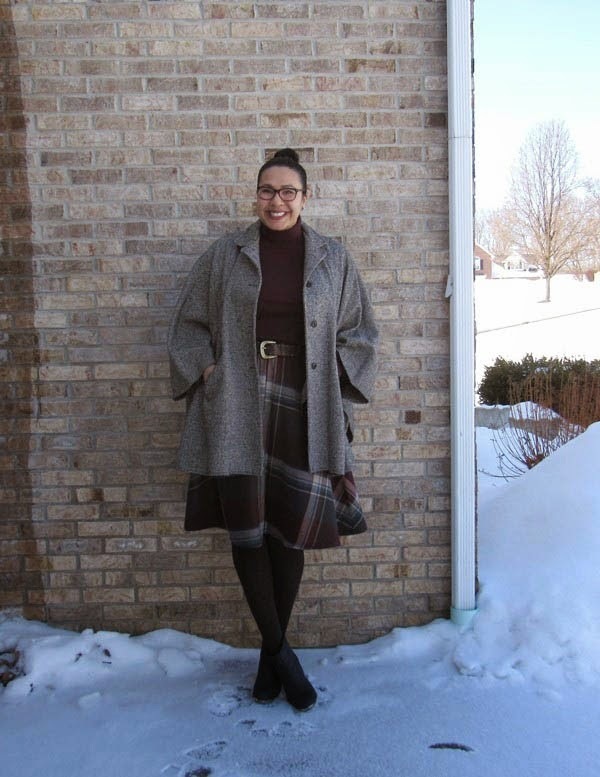 Gracey of Fashion For Giants is wearing a thrifted skirt, turtleneck sweater, and cape. Her belt is Michael Michael Kors and the booties are Sole Society. 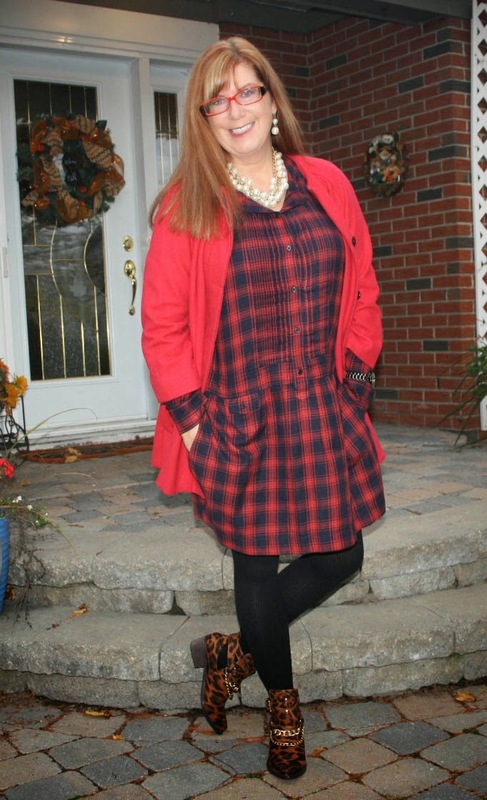 Such a feminine and elegant winter look on Gracey, I do love a gal in a plaid circle skirt! I love these unusual boots on Trina—check out that pointed toe, as well as the sharp cut in the vamp!—and I like how the coloring mirrors her tipped blazer. I can tell you from my many years’ experience as a stay-at-home mother that Ana is one chic mom-about-town. I wish even a quarter of the moms I see day in and day out looked like this at school pick-up. It would give me such a lift! These are such great booties Dawn Lucy owns, I really like them on her, and I can appreciate why flats would be a handy thing to have on hand! 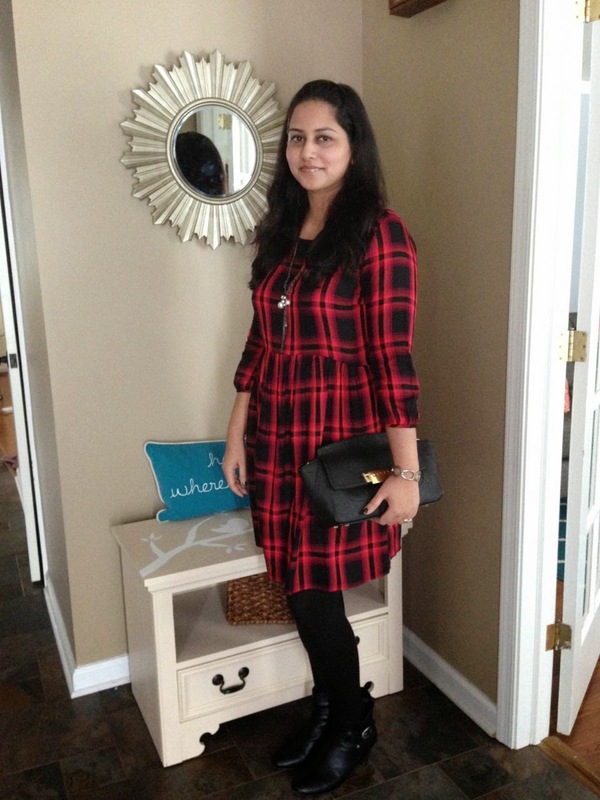 Our new friend Armuta pairs her booties with black tights and a vivid red plaid dress. I like the addition of a long necklace, a chunky bracelet, black bag, and dark manicure to give this romantic look a hint of edge. Fingers crossed that she gets to because I think Jane (and I) could use some warm weather. I love her neutral coat paired with these booties and the glamorous touch of a leopard clutch, dark sunglasses, big bracelet, and a bright red lip. J’adore! Raising money in style for a great cause, as a survivor—it doesn’t get any better than that! Teresa. Photograph by Denton Taylor. Teresa, wife of photographer Denton Taylor, is wearing a pair of Rag & Bone booties, a Christmas gift from Denton a couple of years ago. The white silk pants are by Jennifer Capriati. Since Teresa lives in Manhattan she’s probably inside because it’s been freezing (and snowy!) in NYC for many weeks now. As for the Rag & Bone booties, they are so cool, and I bet they are the exact ones I read all the moms in Tribeca, not to mention supermodel Christy Turlington, love to wear (Actually, Christy is the one who said this. I read it in a magazine.). Amy of Denim & Dots. I never get tired of black and white (do note that beautiful jeweled collar) so I love this outfit on Amy, especially with the unexpected addition of red booties! Jodie of Jodie’s Touch of Style. 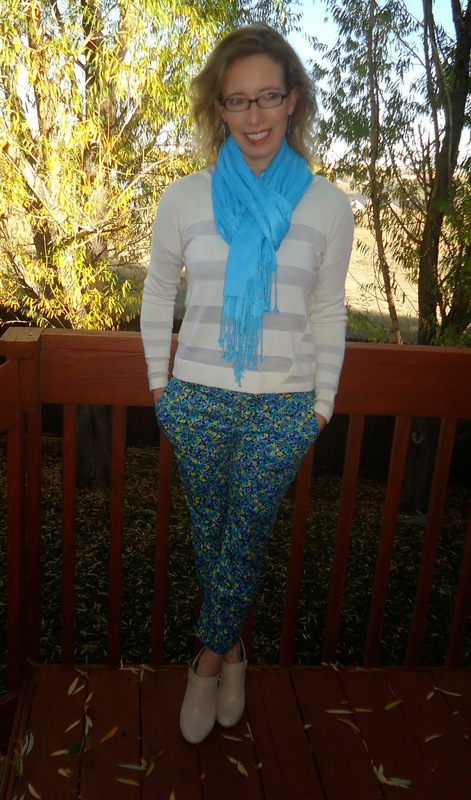 I think this is great transitional style from Jodie—a bit of winter and a bit of spring, rolled into one. 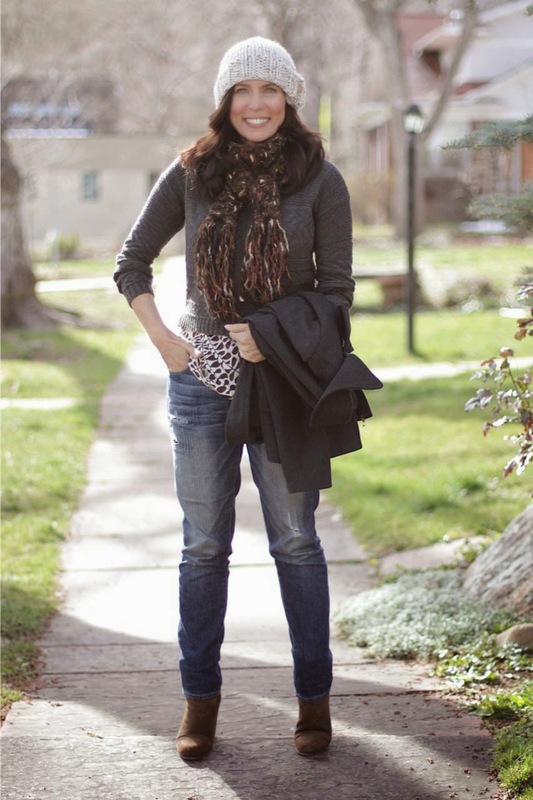 I especially love that blue scarf around a neutral striped top and those neutral booties! 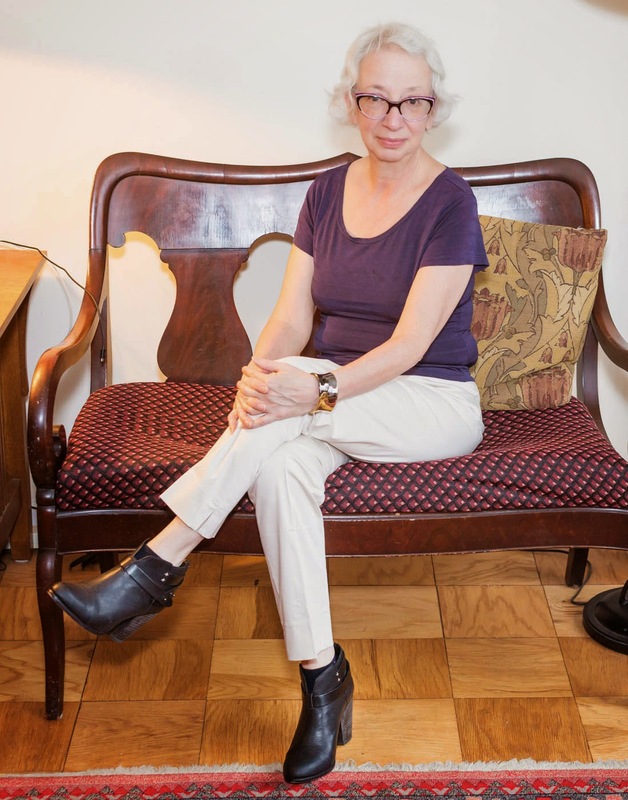 I not only love Suzanne’s boho vibe here but I also completely understand what she is talking about regarding the fit of booties—I too find them a lot easier to wear since there is no chance I am going to step out of them, which has happened with other kinds of shoes! Has that ever happened to you? Deja of Une femme d’un certain âge. I love that wooden heel too, and in fact I love this whole ethereal look on Deja, especially that amazing scarf! Booties are my go-to shoe when I’m going out, whether it’s meeting friends for drinks or going to a press preview at a museum. They look so great with pants and are a lot easier for me to walk in for long city blocks than a high-heeled pump. These wedge booties are from Calvin Klein and I’m wearing them with a coat from J. Crew, black Gap pants, a L’Wren Scott for Banana Republic peony print scarf (a lucky eBay find), and my YSL Tribute tote in aubergine patent that I love for it’s slim side profile. The red leather gloves are from Lord & Taylor and lined in silk. They always cheer me up in late winter! We had a rare sunny day last week and while hunting around for Gwynne’s car (a time-honored tradition in Brooklyn, wondering where you parked your car), Gwynne got these shots over the Prospect Expressway. A little urban grit for you! Love these booties, love this YSL tote! Photo by G. Keresty. For April, let’s focus on layers! If you start with a basic shirt or dress and begin piling on a sweater, a jacket, a scarf and jewelry until you have a beautiful and unique look we want to hear from you! 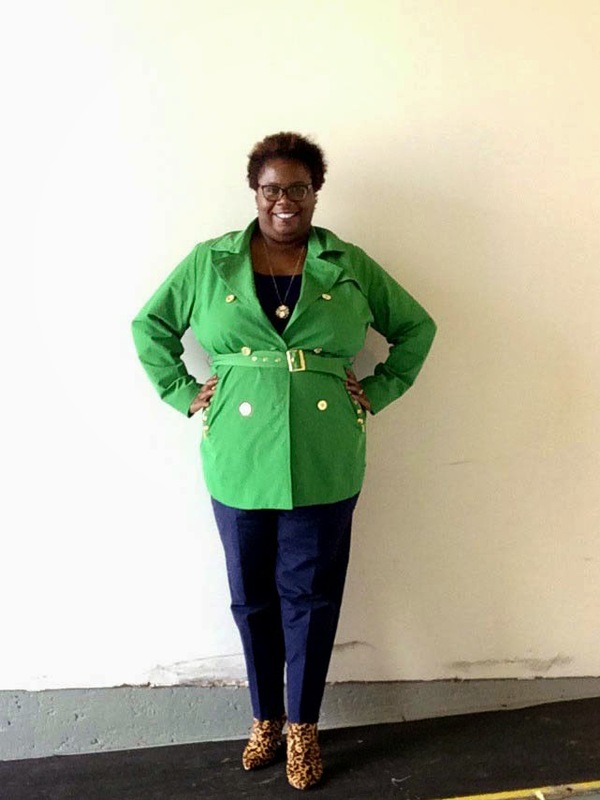 Join us for “How I Wear My: Layers” by sending a photo to us at howiwearmy@yahoo.com by March 30, 2015. Don’t forget to include a few details of all the lovely layers you are wearing! Do swing by Adrienne’s to see even more fabulous looks featuring booties. So many great booties here and ways to style them! 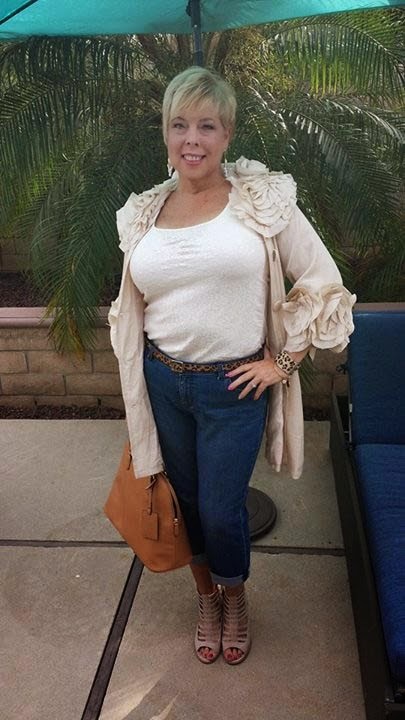 Thanks again Jill for hosting this monthly party, and you look fabulous. Love that YSL. I must say you are doing wonderful layered look Jill! LOVE it. I'm kind of in love with Trina's look too. I walk out of my shoes all the time. That is why often I wear Mary Janes, or boots as I mentioned : ) I think people with narrow heels are more prone to this problem. i love all the different booties and looks. Thank you for putting this together. Wonderful looks this month. I love Suzanne's fringed shawl look and Dianne's caged booties are so hot! And I adore your street style photos. I bet you turn lots of heads walking around NYC! Thanks for all your hard work. Here's to Layers next time! Love all the looks with booties! Makes me want to pull my leopard pair out. Thanks so much for hosting! Can you believe all those fun and stylish boots? Wow! I so enjoyed seeing a few more photos of you this time and especially in action. The boots are a perfect fit with your cropped pants, so very very stylish and I would agree a much easier way of walking around town. So glad the sun decided to come out for a day. Thank you Jill for this monthly get together. This is an impressive list of booties. Fantastic to see all the different styles. I love the ones of Trina (yellow and blue) and the ones of Dawn Lucy (zebra) as I am always drawn to unusual, outspoken clothes and shoes. Which, by the way, is not very clever as you end up with a wardrobe full of stuff competing with each other for attention.... sigh. 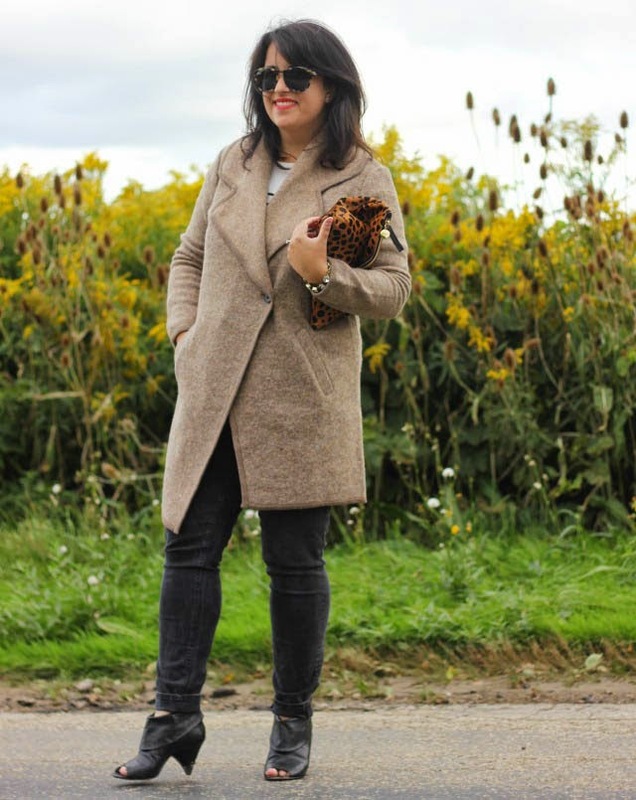 Boots are so much fun to wear and accessorize and I have enjoyed seeing how the gals have styled theirs this month. Great photos too! Thank you so much for putting this together, love seeing all the fabulous looks and looking forward to next month's post. Loving your look here, Jill! Thanks for hosting another fun edition of HIWM! :-) Oh, I just adore the different styles of booties worn by so many lovely ladies! Great pictures - great inspiration! Hi Jill, thanks for including us again, and what a great collection! "Since Teresa lives in Manhattan she’s probably inside because it’s been freezing (and snowy!) in NYC for many weeks now." Haha, you know that's the truth. But also imo as a photog the best way to shoot footware is sitting down, then the subject can fold up a bit and you can get more emphasis on the booties. See, for example, Dawn Lucy's fab photo. Love all the booties!! I especially agree with the lady at the top about booties with dresses or skirts... A great way to make an outfit contemporary. 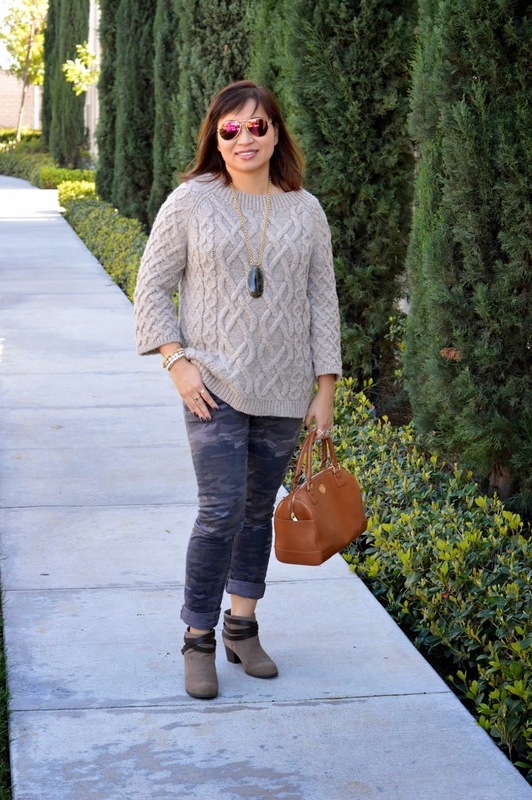 Forgo heels and add booties! Great selection here Jill and especially liked Deja's peep-toe slingbacks. I can't bring myself to say "bootie' aloud. Forgetting where I parked my car is how I got myself on the boot list here in Chicago. You forget and with street cleaning days, block parties, etc. you have to move it and the tickets pile up. Jill thank you so much for including me here as well as Adrienne!! These round ups are so good for inspo and, of course, seeing some awesome pieces like Dawn's zebra booties (LOVE)!!!!!!!!! !